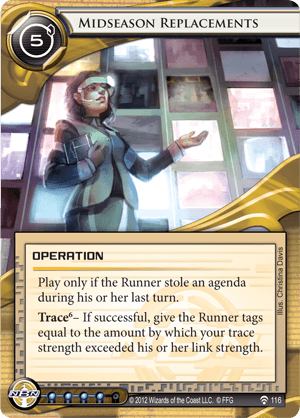 Trace – If successful, give the Runner tags equal to the amount by which your trace strength exceeded his or her link strength. I've come to seriously hate this card. The only card I can think of that is more OP is astroscript. The ability to give the runner 2, 5, 10 tags in one click is ridiculous. True you need to have a good amount of money but that doesn't seem to be a problem. From what I've seen, players like to put up a token defense on hq and r&d, such as errand boy and popup. Meanwhile they just sit back and gain money; and cards with jackson until they have the 3 cards they need. They pray the whole time that the runner doesn't get lucky with their runs, but it doesn't really every happen; its hard to get 7 points before the corp is ready to go. The only good defense is having a crap ton of money but that usually won't happen if you are running. And if you don't run, then the corp scores astro and you lose the old fashioned way. So you run, hit a NYPD and are obliged to steal it, leaving you with no money. The only card that is effective against it is paper tripping, and then only if you are still in the game next turn. Plascrete of course is a must if they are going the meat damage route and not pysco; but it won't hold up to a couple traffic accidents and scorched earths. I suppose clot could save the day in some situations. I feel it should be a double operation with a trace 2 or something. Still good but requires the corp to have A LOT of money. I got 25 tags on turn 3 versus a blue sun deck. They got Curtain Wall and used Oversight AI twice. What am I meant to do, not steal agendas? Play a tag me deck? Plascrete Carapace is just going to delay the inevitable, and corp has too much recursion, so even if their BOOM! or Scorched Earth fails, you still have 20+ tags that you will never get rid of, so they can just do their kill combo later. Even if they don't do a kill combo, Psychographics will win them the game and stuff like Closed Accounts will destroy you even harder. Even if they don't have the ridiculous credit power of Blue Sun: Powering the Future, you can still acquire an un-salvageable amount of tags. A card of this caliber that can give you 10+ tags shouldn't exist. It's not even a terminal or even a double operation! On top of that, the corp can just sit back, gain credits and draw. Who cares about icing up your central servers? If they draw into agendas, good for them, more chance of the runner stealing one as they are meant to, and then you punish and completely cripple them. This sort of playstyle just makes me infuriated. It's so unsatisfying and it really makes me mad, because it's so cheap and easy and it has ruined the game for me. Honestly a stupid card, it shouldn't exist. If you play this card or the blue sun combo, good for you. Hope you're having fun.